I have been both blessed and cursed to have three built in extras whenever I’m out on a photo shoot. Sometimes I’m out primarily to walk the dogs, and the photos are an added extra, and sometimes I’m out to try to capture a particular scene, and the dogs tag along. The dogs however see it differently, and as far as they’re concerned it’s always all about them. If I’m tucked behind my lens, lost in the beauty of my surroundings for too long, they have developed various strategies for pulling my attention back onto them. Molly as the youngest is the least sophisticated and simply pushes her way right up to the lens, completely taking over the scene. This is photo bombing at its best, and it always makes me laugh, no matter how long I’ve been lining up a potentially beautiful shot. This time the light was changing very fast, as pools of sunshine would peep out from small gaps between speedily moving clouds. I had just got my settings right……and Molly popped up for some attention, which meant I missed the shot. Don’t worry though, there was another pool of light along in a minute or two. Maisie and Willow have been at this extras game far longer, and they are more subtle and sophisticated in their approach. They will wander into shot at a discreet distance, and I often won’t notice immediately. I had spent a while setting up this shot when I spotted my uncalled for extra, posing in a grassy pool. I took the shot anyway, hoping she would move, as she often does, once I stopped looking through the camera. However she wasn’t for shifting, as she wanted me to walk out towards her, so I just took the next shot, deliberately making her the focus. 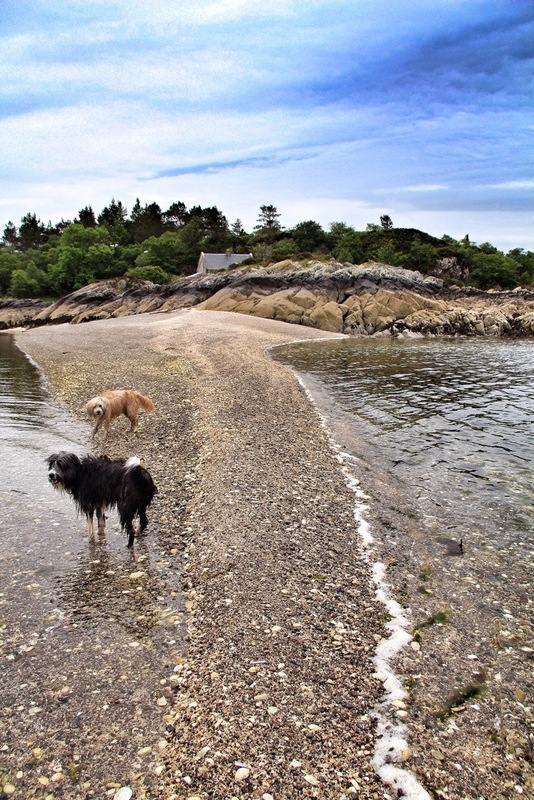 I never did manage a shot here without one or all three dogs in shot, but I still like the effect. Yesterday I had walked out to a coral beach which can only be reached at low tide, and as the tide had turned I was acutely aware of having only a limited window of time to take photos before I would become trapped. This photo was particularly time pressured as I was standing on a narrow spit of sand and coral which was fast disappearing into the rising water. The gorgeous length of sand sweeping into the background would only be there for another few minutes. Behind me is water, and no matter how hard I tried I couldn’t get all three dogs into the water and out of shot at once. The best I managed was two uncalled for extras, so I will just have to go back another day, perhaps with another human companion to help with the required dog herding. Sometimes it’s simply wonderful to have three willing extras to add interest and focus to a photo. Here Maisie is enjoying watching the waves and the seagulls, and she was so beautifully lit I could resist taking a rear view portrait. This reminds me of my childhood spent scrambling over these rocks and seaweed, usually with a doggie companion. This final photo, with added extra, was all lined up beautifully. Just as I pressed the shutter Maisie appeared from behind the coral bank, where she had been patiently waiting in hiding to make her entrance. Somehow she has positioned herself perfectly in the landscape, and I actually really like this accidental extra. The dogs bring such joy and mischief to my walks, and despite many ruined or impossible shots, I wouldn’t be without them. There’s always another day for taking images, but the dogs are here in the present moment, adding extra emotion and engagement to each moment of life shared with them. On reflection they are always a blessing, and a great lesson in not taking life or photography too seriously, after all it’s supposed to be fun. 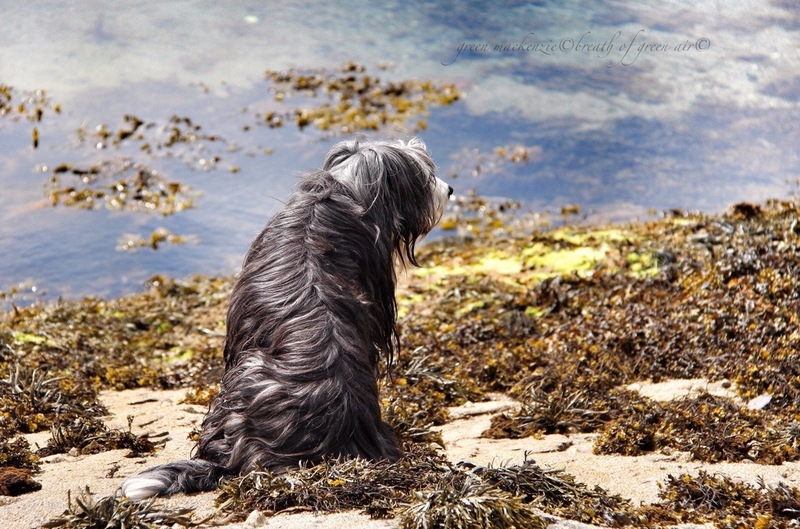 This entry was posted in dogs, mindfulness, photos, weekly photo challenge and tagged dogs, landscapes, mindfulness, nature, photography, postaday, scotland, travel. Bookmark the permalink. Well I’m delighted to bring a morning smile to anyone’s lips, but especially lovely to think of you heading off into your day smiling…..because of Molly….she does that to me often! Oh gosh, I love these photos! My favorite has to be the first one, where it looks like your dog popped in unexpectedly. So adorable! LOL Love that first one!! It’s not easy to take photos with dogs hanging around! All these shots are just brilliant! Absolutely LOVE that first shot, Seonaid! That face and smile, totally makes me miss my doggie! You’re definitely blessed! Wonderful! 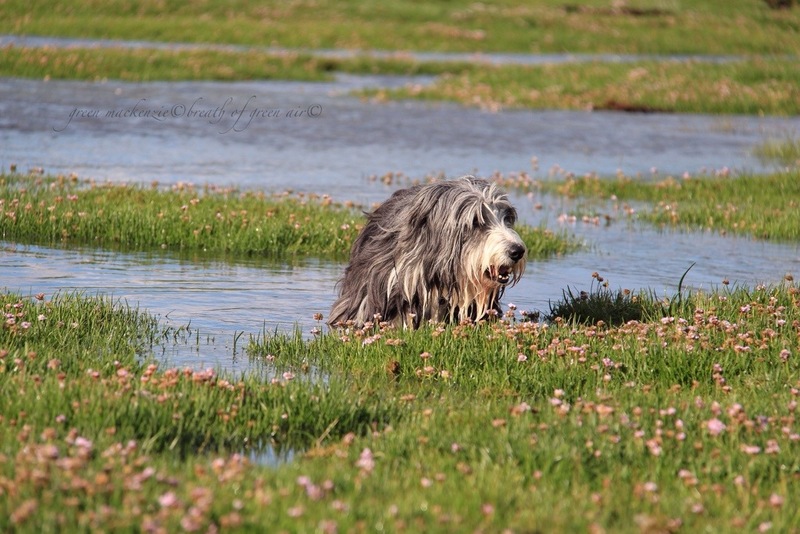 Bearded collie, and ?? 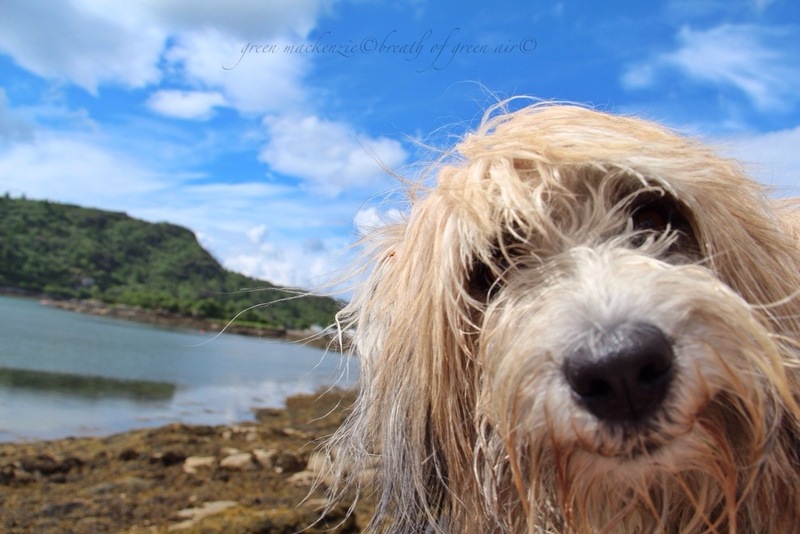 Oh, beardies are just wonderful…now you got me longing again! They are all adorable – but Maisie sounds really cute…The last photo is extra lovely! Maisie is very cute, and at 12 years is beginning to slow up a little, but is still full of more bounce than your average dog. She is very loyal, but has a mind of her own! I so enjoyed this one Seonaid. Your pups are lovely and I just love that they so want to be a part of your photography!! The scenes are beautiful but the dogs really add to them rather than detract. They are lucky to have such a patient loving mom!! That first one of Molly still makes me laugh every time I see it! It’s impossible to be cross with them, as they look so cute and happy! That’s Molly, and she’s an incredibly happy dog. It’s very hard not to smile when she’s around! I don’t think that your wonderful doggies believe that they are “extras” at all! To them the scenery is the “extra”. What fun and a blessing to have them!! They are very happy dogs, it’s the breed, and of course they work as a pack….a herding pack at that. I find myself being herded and moved across the landscape by them! The salty coats is an interesting question. The salt water actually seems to condition their coats, rather than leaving it sticky and tangled as it does with our own hair. They are from working stock, registered as working Beardies, and their coats are considerably different to the coats you find on Kennel Club registered Beardies. They were bred originally as cow herding dogs, used to drove the highland cattle all the way down to the lowlands and even into Northern England. 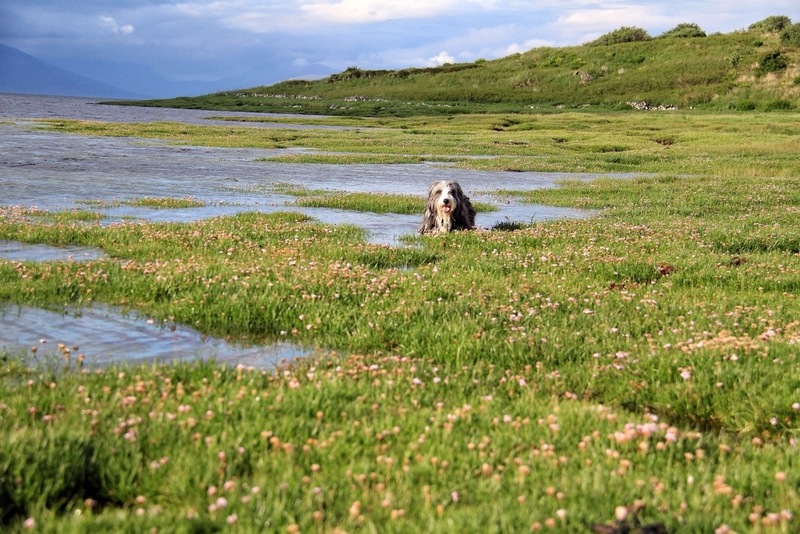 The old drove routes often involved swimming the cows across sea lochs so perhaps their fur is specially suited to salt water? Certainly they are soft clean and fluffy after a day by the sea! That’s exactly what happens when the Beardies come in wet and muddy. Teflon is a great description, and very true. Their black paws will have returned to white once they have dried off, and there will be a dry puddle of dirt on the floor! Priceless is the perfect description of Molly’s photobombing! I have found that having three dogs has helped me focus on what really matters in life…..wet floors and dog hairs are just part of the deal…….but it really is incredible the size and speed at which fluff bombs build on wooden floors when you live with three very hairy hounds! Don’t we just love our extras? Photo bombing at its best. Wonderful interpretation of extras, extra specials. Oh yes Caro, and I loved reading about your adventures on the island with your dogs. I have had a similar trip away on my own with just my dogs for company, and I loved every moment! 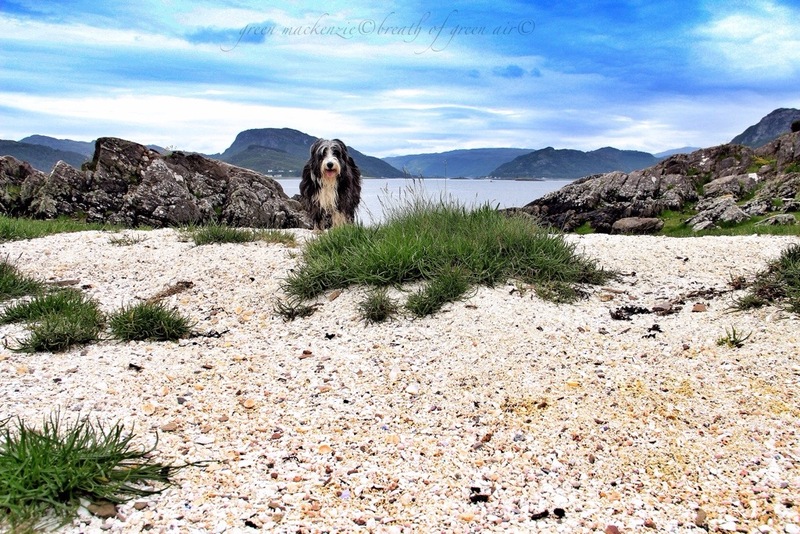 Lovely photos – and the dogs look like fabulous companions. Thanks very much, I’m so glad you enjoyed seeing some of the dog chaos behind the scenes! Lost and lots of pats for Molly, Maisie and Willow and a big hug for your great writing! Thanks so much for the great big hug Dina, those are always welcome, and the dogs enjoyed their extra pats! They thanked you with lots of enthusiastic tail wagging! There’s never a dull moment with three Bearded Collies around! Your dogs are the world’s best photo-bombers. I didn’t realize you also have three little fellows tagging along: my beagles, unfortunately, can’t be off the leash outside, ever, so I get a lot of unintentionally moving shots as they tug away. But the great outdoors would be so lonely without them. They are very skilled photo bombers, with lots of practice! You have managed to capture some magical pictures of your dogs. Such a lovely post – I love the smile on your dog’s face in the first photo. It just sums up what your post is about! Thanks Alison, that lovely doggy smile always has me smiling back. Its hard not to be happy when you’re around my dogs! Now you might just come to regret that offer! I love Hexham it’s so pretty, and filled with fascinating and mysterious history!